The ancient and noble art of the ninja is the theme of this online slot from Red Tiger Gaming – it’s called Ninja Ways and our hero will leap across the screen to award multiple mini-features as well as plenty of free spins. 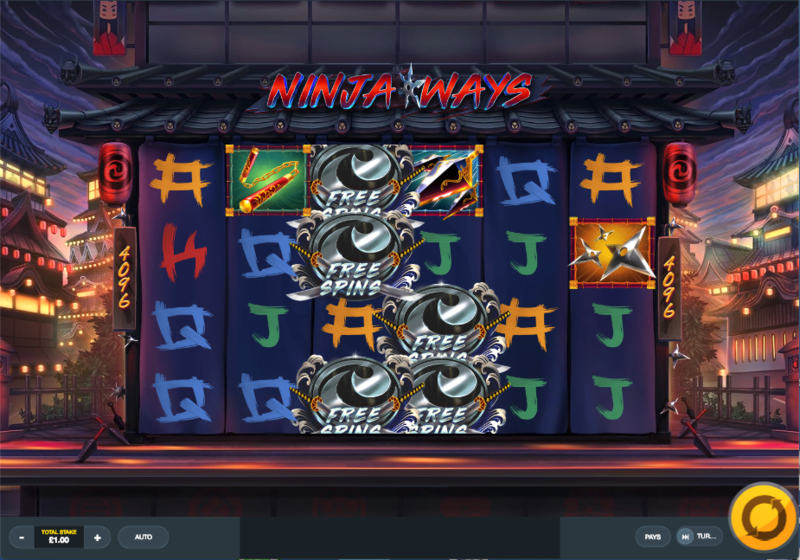 Ninja Ways is a six reel slot with four rows and 4096 ways to win which means that there’s no payline structure – matching at least three symbols in adjacent reels starting from the left is a winner. The reels spin on the sides of a traditional Japanese structure behind which is a street view from times past. The four high value symbols are an array of weaponry such as nunchucks and throwing stars while 10, J, Q, K and A make up the lower values. Our manga-inspired ninja is wild and he will replace all others to help form winning icons except for the crossed swords free spins icon. This is triggered by landing at least five free spins symbols on adjacent rows starting from the left hand side – each symbol will reveal a number of free spins which will be totalled, During this round any free spins symbols which land will reveal a number which will added to your total. Ninja Ways – the ninja will slice up the reels, leaving behind identical symbols. Ninja Wilds – wilds with multipliers up to 8x are added to the reels. Ninja Door – a large symbol of 2×2, 3×3 or 4×4 will be added to the reels. 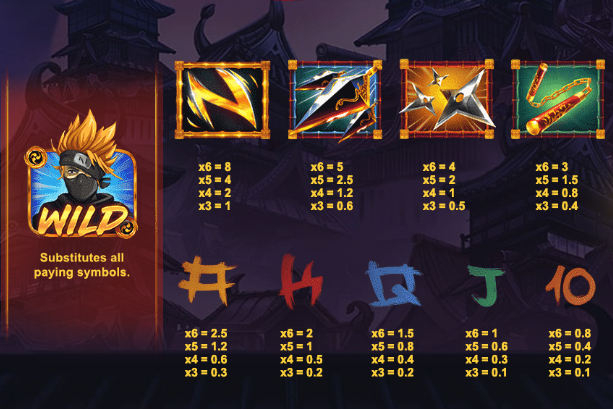 Ninja Ways is a slot with a manga-esque design but also a nod to traditional Japanese culture, not to mention lots of base game features and a free spins round to boot – try it out, you might just like it!